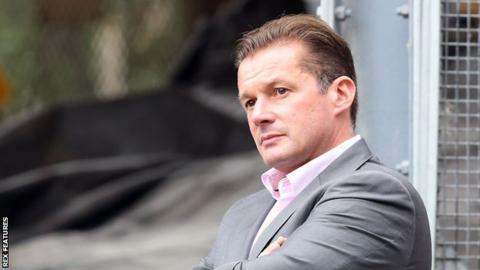 Peterborough United manager Graham Westley is targeting the League One title next season. Posh, who are 14th in the third tier, last won silverware in 2013-14 when they lifted the Johnstone's Paint Trophy and Westley is targeting trophies sooner rather than later. "We're serious about having title ambitions next year," Westley told BBC Radio Cambridgeshire. "People either contribute to winning or there is no place for them." Three successive victories had helped Peterborough recover from a run of seven winless games through February and March, before Fleetwood beat them on Tuesday. "I was fuming," Westley said. "I expected to beat them. I expected our lads to find the motivation and drive to win that game. "The other night was the first time I really felt as though it was time for me to start making my mark." Peterborough had moved to within three points of the play-offs after their nine men held off Chesterfield in thrilling fashion at the start of February, but now find themselves 12 points behind sixth-placed Millwall. Westley continued: "If I go back to my Preston days, I made the mistake of walking in and putting my size nines all over the place before I understood the place. "I've taken time to find my feet here. I've come in and I've had a long hard look at the way things work, rather than trying to impose myself too much too early."